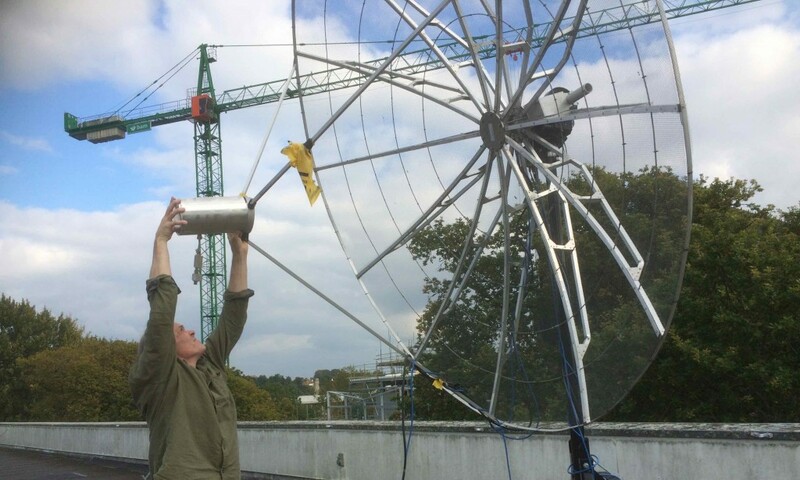 Chris Brunt mounting our feedhorn to the University of Exeter’s 3m mesh dish. Below the feedhorn you can see the LNA and a filter. 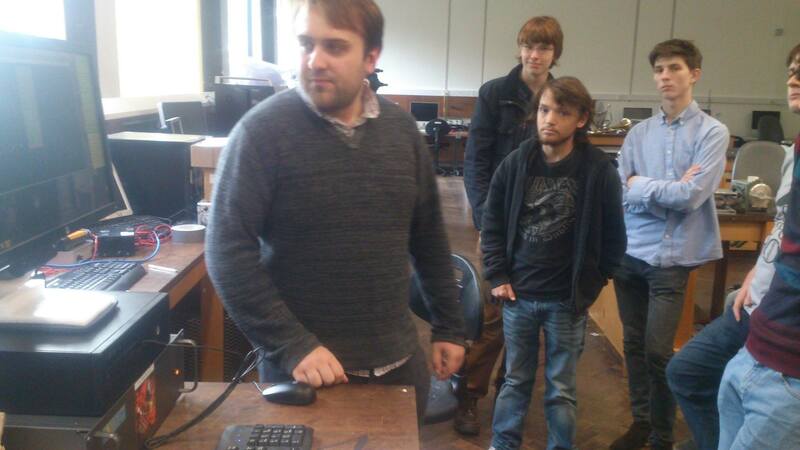 Last Thursday, the newly formed science team for the 2015-2016 academic year met in the third year project lab at the University of Exeter to conduct the first proper test of the receiving equipment of the telescope. To test, Dr. Chris Brunt allowed us to use the 3m mesh dish on roof; similar in design to ours but with a much smaller collecting area. The feedhorn was mounted at the focus of the dish and the the Low Noise Amplifier (LNA), filter and another amplifier were chained down from the roof and into the lab where our receiver and computer were set up. The science team poring over the telescope’s components in the lab. 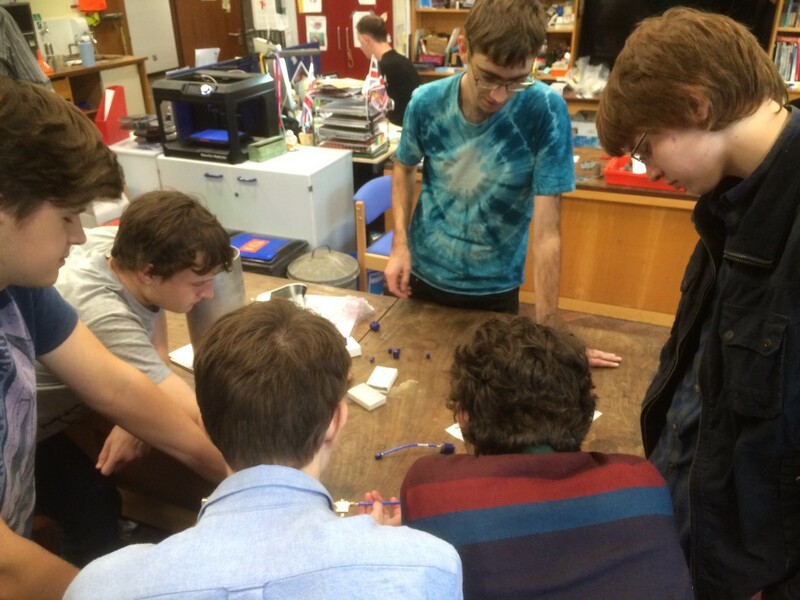 The science team gathered around the receiver and computer eagerly waiting for the first results to come in. Although the radio telescope at the university usually has a chain of filters to filter off unwanted signal, we fed the coax straight into our Spectracyber receiver. The dish was pointed toward the constellation of Cassiopea, which means that not only should we have the contents of Cassiopea in our beam, but we should also be able to observe the of the Perseus spiral arm in the background. We tentatively started the software scanning, hoping that everything would work. Sure enough as it scanned through frequencies we saw two very large peaks form on the spectrum. This was an unofficial first light for the telescope. The first dataset taken from our receiving equipment. Plotted is the doppler shift from 1420MHz at 0 against the recorded voltage. Two clear peaks are shown, each corresponding to different astronomical objects. A combination of our larger dish and lower noise site shoudl decrease the noise even more. The data from the receiver is read off as a voltage for a given frequency. This frequency is represented as a doppler shift from the rest frequency of 1420.4 MHz, negative numbers corresponding to objects moving toward us and positive numbers corresponding to objects moving away from us. The full bandwidth of the receiver is represented in this plot, as we can receive 1420 MHz ±2MHz. 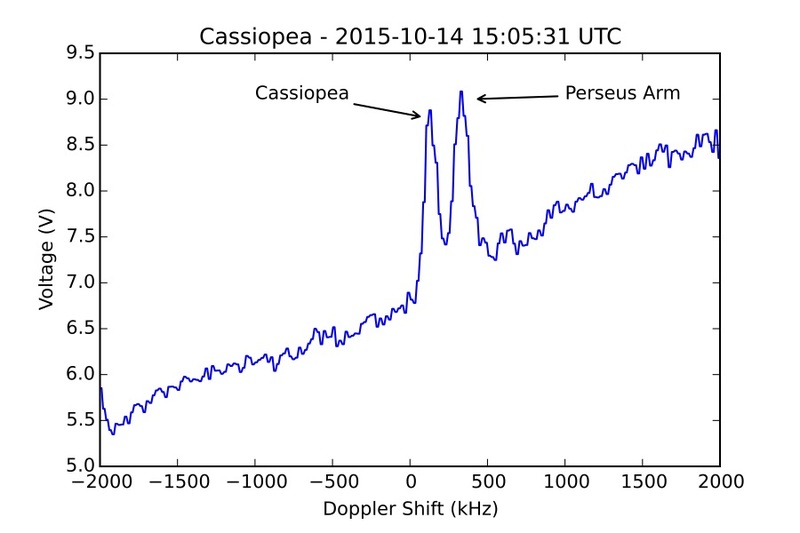 In our first set of data we can see two clear peaks, one being at ~100MHz and the second being at ~400MHz. Given the direction of our beam, we are quite sure that they correspond to Cassiopea and the Perseus arm of our galaxy respectively. With this development in the project, and with the build team very close to making the push to construct the dish, this is an exciting time for the XRT-C project. We’ll very soon be in a position to commence science operations with out own dish and equipment.